Strategic War in Europe takes you back in time to World War 2. Following the 'easy to learn, hard to master' design principle, Strategic War in Europe combines accessibility with a plethora of strategic options. A compact, large-scale map and clear basic rules will not overwhelm you, yet the choices you will be presented with should satisfy all your tactical needs. 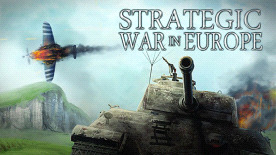 From overthrowing governments and researching new technologies, to securing air supremacy and supplying your troops by water and railway, Strategic War in Europe is a strategist's dream. Seven scenarios with up to 25 controllable countries, each with five scaling difficulty settings make for an incredible replayability. When pitching yourself against the AI is not enough, Strategic War in Europe offers hot-seat and PBEM for all your multiplayer needs. Match your wits in an epic East vs. West showdown or try to survive together as Poland and Norway. Muster Your Panzer Corps! Prepare Waves Of Infantry! The War Begins Now! Control the skies with air combat, recons, fighter interceptions, bombardment, and even nukes! Strategic War in Europe, Wastelands Interactive, and other trademarks and company logos are protected by copyright laws and cannot be used without prior written consent.